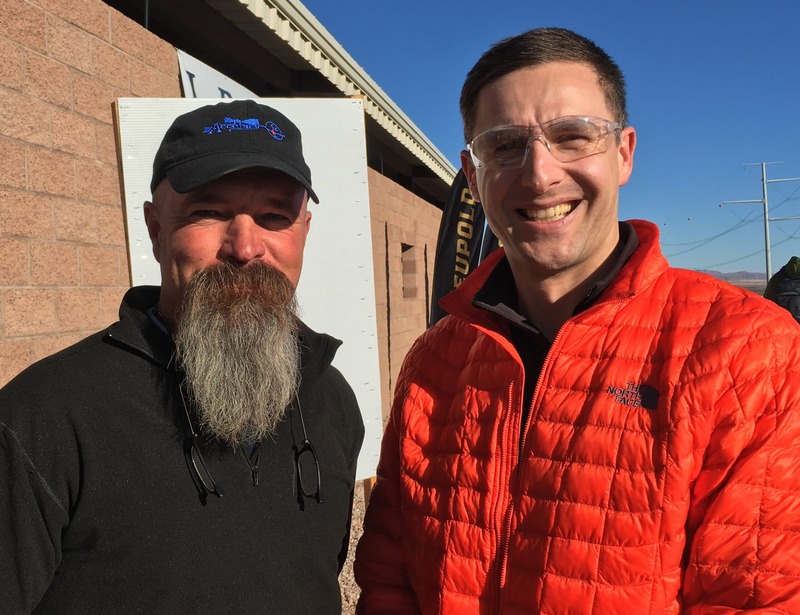 Todd Hodnett (left), precision-shooting instructor, with Nicolas Johnson, editor of TheGunBlog.ca, at the SHOT Show 2017 range day for military and police. Today’s SHOT Show range day for military and police was a blast. Big array of small arms, mainly semi-automatic and bolt action rifles, with some full-auto. Staff were friendly, helpful, knowledgeable, even after hours of deafening gunfire and a never-ending flow of guys lined up to shoot. They made the day fun, informative and safe. The guys loading the mags might have had the toughest job of the day. Loading mags. By hand. All day. Great to meet Todd Hodnett. His videos with Magpul got me interested in shooting precision rifles past 300 meters, and helped me believe I could actually do it. There is no way to shoot everything on display. I was there for 5 hours, visited each company’s shooting station, waited in line a lot, and shot nine firearms at four stands. Enjoyed every one. It’s a special treat to shoot top-end gear set up by professionals with spotters who help you make good hits, helpers to load your mags, in the desert under a clear blue sky in January, with mountains as your backstop, half an hour from the casinos of Las Vegas. Biggest surprise: How light the recoil was from the Daniel Defense DD5V2 in 7.62 NATO. Disclosure: I paid for my own registration and arranged my own travel and logistics. Exhibitors supplied all gear and ammo for all attendees. The day was organized by ATAC Global. Photos and video weren’t allowed. Shot the .300 Norma model of the Accuracy International MC (Multi-Calibre) rifle, suppressed, with a NightForce scope, and the AX in 7.62 NATO with a NightForce, unsuppressed. I shot both from prone at a steel disc at 100 yards, and torso-sized steel at 300 yards and 600 yards. It was my first time shooting a calibre as large as .300 Norma, and my first time shooting with a silencer. I was blown away (hee hee) by how easy and light the recoil felt. The suppressed .300 Norma felt lighter than the unsuppressed 7.62. And quiet! Nano, mounted on B&T Universal Service Weapon: Neither the little red-dot sight nor the 9 mm firearm is available for purchase yet, as far as I can tell. Besides being an eye-catcher, using the folding stock made it easier to get fast, accurate hits, especially past 25 yards. I was told the gun would be available in Canada through Wolverine Supplies. CEU (Concealed Engagement Unit): The CEU allows you to shoot from behind cover without exposing your head or body. We shot it from a Larue Tactical AR-15. Also shot COMPM4 and H-1 + Magnifier from Larue Tactical AR-15s. Torso-sized steel targets from about 20 yards to 400 yards, and moving robots from Marathon Targets. Didn’t get to shoot the Barrett in .416 calibre, but stood in line behind it long enough to hear its very loud bang repeatedly and feel my innards heave with each shot. I was next in line to shoot the new Kraken model by this company based near Montreal, and got bumped by a group thinking of buying 500 of them. I can’t compete with that! Rob Furlong of Edmonton-based Rob Furlong’s Marksmanship Academy was the spotter for the Kraken shooters. Shot the DD5V2 in 7.62 NATO with a NightForce ATACR scope out to 400 yards, from standing, with an improvised front-end support (I think it was a target stand). This AR-10-type rifle is similar to the DD5V1, with a barrell of 18 inches instead of 16 inches. I expected a bruised shoulder, and was surprised by how light the recoil was. They supply backpacks to U.S. Navy SEALs and other Special Forces units, as well as to civilians. Supposed to be as rugged as they are practical and versatile. M60E6 Light Machine Gun and M240 Medium Machine Gun. Got to shoot about 10 rounds of belt-fed 7.62 NATO from each of these in short bursts, from prone. Torso-sized steel at 100 yards. I even hit a few times. Cool. Very cool.